Deputy District Attorney Paige Callen is being stalked. The man stalking her is motivated, methodical, and relentless. The police aren’t merely one step behind Paige’s stalker; they’re stumped. They haven’t a clue on the identity of her assailant or why he’s targeted her. Paige’s father, retired Judge ‘Iron Gene’ Callen, isn’t about to sit on the sidelines while a homicidal lunatic stalks his only child. Callen hires retired San Francisco P.D. Inspector turned private investigator Bob Farrell, to the dismay of the local police. The cops are well-aware of Farrell’s reputation as a reckless wild card. Judge Callen, however, knows him as a man who doesn’t let the rules get in the way of getting the job done. Farrell enlists the aid of former Iowa Deputy Kevin Kearns to help him protect Paige, and to stop a madman before she becomes a statistic. But to find her stalker, Farrell and Kearns must first learn why he’s launched his lethal crusade; a journey none of them may survive. "Grizzled private eye Bob Farrell again teams up with young ex cop Kevin Kearns, this time to hunt down Ray Cowell, a deeply disturbed stalker targeting the daughter of the judge who put his father behind bars. Hired by the judge to keep his daughter safe, the tension mounts when Farrell and Kearns meet resistance at every turn from the local police force as they hunt down the hunter, leading to a riveting and bloody climax. With perfectly crafted characters, riveting and authentic police procedure, and a satisfying breakneck pace, Sean Lynch’s THE FOURTH MOTIVE is nothing less than a tour de force of the detective thriller genre. " "Local author, Sean Lynch, is back with a vengeance! His new Farrell and Kearns novel is a fast-paced, tension-filled mystery, perfect for fans of James Patterson, Lee Child, and John Sandford. This time around, the clock is ticking on our heroes as they try to piece together a puzzle filled with revenge and longing before the protagonist stalks and threatens everyone connected to Deputy DA, Paige Callen." "Remarkably, Lynch accomplishes one of the most difficult things in crime fiction: by the end of the book, he has given us enough of the villain's back story and thinking to make the reason for his crimes understandable. Mind you, his reasoning is twisted and his actions are reprehensible, but at least the reader finishes with a clear notion of what has driven him to kill repeatedly." Knock Knock --Who's there? Farrell and Kearns, Cooks Beware! 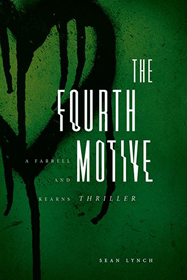 "There is no shortage of action in THE FOURTH MOTIVE, the second novel from Sean Lynch featuring Farrell and Kearns. In fact, the action is nothing short of relentless—exactly what you want in a high-octane thriller. As in WOUNDED PREY, the story is dark, yet psychologically fascinating, and impossible to put down. Lynch knows how to paint one hell of a bad guy—truly the stuff nightmares are made of." "I’m always pleased when I discover that there is going to be a sequel to a novel that I’ve enjoyed. It feels like a real treat. Last year I read Wounded Prey by Sean Lynch, and was impressed with the debut. I’ve been looking forward to reading more and that chance has finally arrived." "Sean Lynch has delivered another solidly entertaining novel. Farrell and Kearns are back. If you enjoyed book one then you’ll definitely get a kick out of book two."